PrecisionCraft clients approach the planning of their homes in different ways. Thus, a comprehensive overview of architectural styles may be helpful during the decision-making process. With individual needs in-mind, this series of articles offers insight into our six, unique, architectural styles. 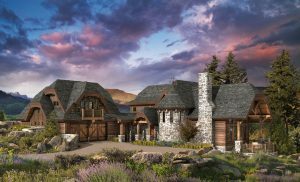 Part One introduced our Mountain Modern™ and Western Heritage architectural styles, two different approaches to luxury mountain architecture. If you have not previously read Part One of this series, please do so here. This article, Part Two, offers details around two additional PrecisionCraft design styles: French Country and Appalachian Legacy. Whether you find yourself drawn to the bucolic valleys of southern France or the sun-warmed hills of Appalachia, one of these architectural styles is sure to inspire you. Characteristics of our French Country collection include hipped roofs, steeper roof pitches, and a generous use of small windows. If you are someone who believes the kitchen is an important gathering point of a home, or that a stone fireplace is perfect to curl up next to, French Country style architecture will surely appeal. It also easily incorporates into your mountain style home. 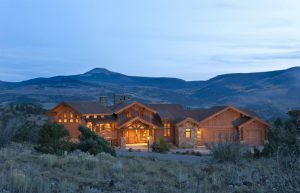 An excellent example of this seamless integration is the Montclair conceptual floor plan customized for the Idaho residence shown above. A charming example of this is our Chaumont design concept. Do not let the cottage-like exterior of the Chaumont, nor its stone-lined turret, deceive you into thinking it is anything other than an authentic, natural log and timber structure. Inspired by the Provence region, Chaumont and other homes in our French Country collection offer clients the log and timber home they expect, in addition to the comfortable and elegant aesthetic they deserve. Harkening back to the style’s traditional roots, our French Country style homes are infused with an historical flavor reminiscent of the southern French valleys from whence we first drew inspiration. Clients drawn to this style seem to concur, often musing about the style’s innate feel of a discreet and old world charm. When the courtyards and stone accents of French Country are not quite what a PrecisionCraft client is looking for, they often find themselves smitten with the simple roof lines and functional simplicity of our Appalachian Legacy series. The word “Appalachia” dates back to 1528. And, while our Appalachian Legacy series is not quite so historical, it is one of our iconic architectural styles. This is because it always provides a confident, authentic, mountain feel. Appalachian Legacy style homes almost beckon you to leave your smartphones behind. Features of Appalachian Legacy style homes include square or rectangular logs, dovetail corners, shed dormers, and shingled gables. This collection of homes offers one of our most family-friendly layouts in addition to single-level living options, and scrumptious chalets. And, while accommodating a variety of lifestyles and needs, Appalachian Legacy style architecture has one thing in common; it gracefully reminds us of simpler times. If visiting with friends while sitting on your covered porch sounds like you, the charm and functional simplicity of Appalachian Legacy design may be exactly what you are looking for. This architectural design style almost beckons you and your guests to leave your smartphones behind. This design style captures centuries of America’s rustic heritage. Known for smaller, rough-sawn or hand-hewn timbers, Appalachian Legacy homes often blend log walls with non-log walls, sometimes including walls of metal siding. By incorporating different and rustic materials into the walls, they truly become a showcase. Another distinct architectural feature of Appalachian Legacy inspired design is that a home’s sections look as if they were added on over time. The visual appeal of these distinct sections cannot be overstated. The Blue Ridge design concept, for example, has been customized countless times, with each manifestation beautifully incorporating different client needs and preferences. Yet, each customized Blue Ridge design concept retains the multiple rooflines which emulate the home’s sections. You can view client customizations of our Blue Ridge floor plan concept here. Our Appalachian Legacy architectural style reflects the enduring and endearing myths of America’s Appalachia. From logs to vertical siding and native stone, this design style captures centuries of America’s rustic heritage. Our in-house team, M.T.N Design, frequently works with clients customizing Appalachian floor plans. In addition, our architectural designers often create fully custom Appalachian style homes. Learn more about our talented design team here. Please visit our blog in two weeks for the next article in this architectural styles series. How Much Maintenance Will My Log Home Need?